Our philosophy of empirical verification means that AQUASYS firefighting systems undergo full-scale fire tests. Close cooperation with independent institutes accredited in accordance with EN17020 and EN17025 ensures reliable and internationally recognised verification management. Our numerous certifications confirm our compliance with all application- and country-specific approval requirements. 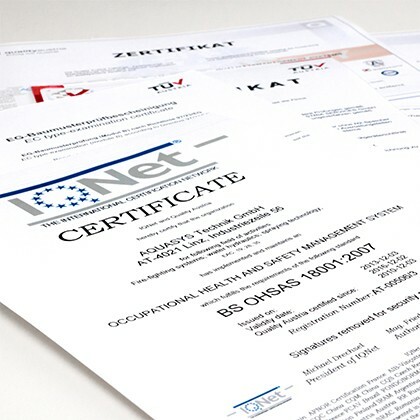 In addition, AQUASYS implements a quality management system in line with EN ISO 9001, an environmental management system in line with ISO 14001, and an occupational health and safety management system in line with OHSA. To ensure a uniform quality assurance concept, our production facility is also certified by the globally recognised VdS. All AQUASYS systems are manufactured in our VdS-certified production facility.